We normally go over the most highly leveraged plays, or some collection of them, when we round up Brian Burke's WPA from Advanced Football Analytics every week. The list is almost always bottom-heavy, comprising plays that just happened to occur in the fourth quarter, or long touchdowns, like Latavius Murray's 90-yard, second-quarter touchdown on Sunday, which came in as the seventh-most influential offensive play. But there are also plays buried in the list that seem like strange fits next to touchdowns to take the lead in the final minutes, or game-icing field goals. With the Bucs leading (!!) the Bears 10-7 with just over five minutes left in the third, Josh McCown was flushed out of the pocket, seemed to pin the ball to his thigh like an armful of textbooks, and had it immediately punched away by David Bass and recovered by Christian Jones. This dropped the Bucs' WPA by 27 percentage points, fifth-highest on the week. 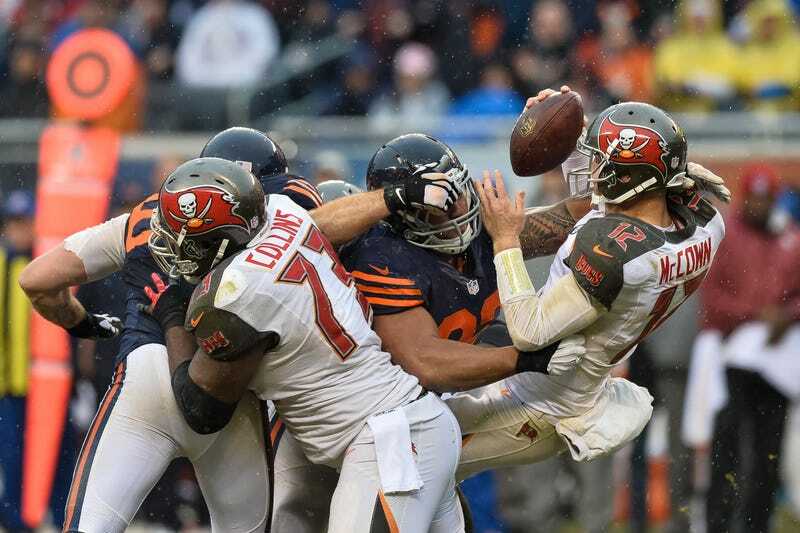 Chicago started its next drive from the Tampa Bay 13, and the very next play, Matt Forte ran a simple counter, outran the six Bucs defenders, and cut inside of another for an easy 13-yard score. On the next play, the McCown was intercepted from his own 21, and the ball was returned to the 15. The two plays that followed that first fumble are obvious game changers, and maybe the original turnover is too. Up three in the second half, the turnover put Chicago immediately into field goal range, and within range of a possible touchdown, which came. And the Bears only had 204 yards of offense on the day, which isn't taken into account in WPA, but makes the turnover even worse. The Bucs have spent the season getting blown out in the first quarter, but this is a new one: a precipitous dropoff in the third, kicked off with the kind of disaster that's hard to manufacture outside of the confines of a game-deciding drive in the fourth.